A scientist who had a film of an eight-year-old child being sexually abused on a storage device has been sentenced. 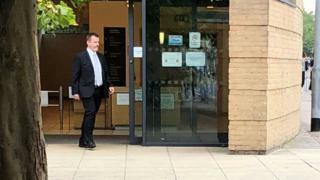 Dr Nicolas Le Novere had viewed abuse images since the early 2000s until 2016, Cambridge Crown Court heard. The senior group leader at the Babraham Institute admitted making indecent images of a child and possession of an extreme pornographic image. Le Novere, 49, of Tower Road, Sawston, was given an eight-month jail term, suspended for two years. The Babraham Institute, which he joined in 2012, said it was unaware of the charges involving him but he has been suspended pending a full investigation. His research focuses on cellular and molecular neuroscience and computational modelling, and has been cited more than 20,000 times, according to Google Scholar. He was sentenced over two films of a sexual nature - one involving a 12-year-old and the other a 16-minute film featuring an eight-year-old - and an extreme image found after police executed a warrant at his home in August 2017. He accepted it was "not an isolated incident", the court was told, but the films had not been viewed since 2008 and the image since 2011. Mitigating, Shaun Esprit said that Le Novere's viewing of abuse images had been "sporadic" but he recognised in his police interview the impact of viewing them. Mr Esprit added the defendant was "beside himself at the upheaval he created" in his personal life as a result of the police find. Judge Jonathan Cooper told him: "You fully understand the harm that's caused by people like you viewing images created by others. You have appreciated how much of your life you have put at risk. "Every image you had downloaded had reflected a crime scene and every crime scene contained a real victim." As well as the suspended sentence he was given a sexual harm prevention order for 10 years. Prof Michael Wakelam, director of the Babraham Institute, said it was "extremely shocked and dismayed to hear the news".